But it seems that smart money is on the run, as ticket prices are falling on StubHub, with tickets being scalped as low as $750 and still not selling, because Burners will not pay above facevalue and the recent announcement that 2,000 additional tickets will be distrbuted by STEP and a private sale has struck fear into the hearts of the scalpers and has them on the run. Prices are falling! 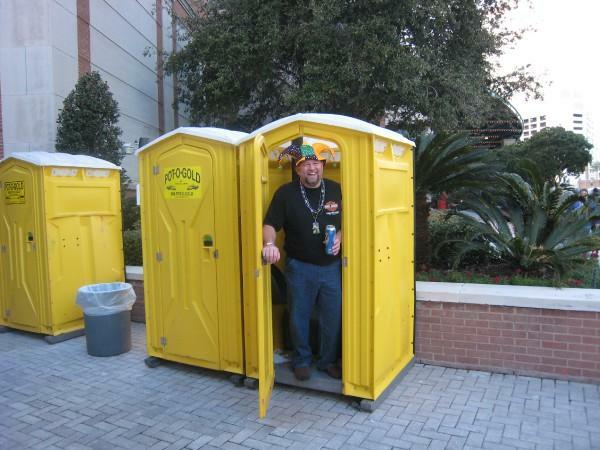 Look at the satisfaction on this man's face as he exits a Gold PortaPotty. Have Faith and Buy Late! Let's drive these scalpers out of business! Please sign the petition and Join Burners against Scalpers today! Did you know, some people believe all scalping should be illegal? Would you like to join those people? Join Americans Against Ticket Scalping and help end scalping today!